Archeologist Carolyn Boyd, of Texas State University, at White Shaman Shelter on the Pecos River in Val Verde County. Boyd has spent more than two decades studying the shelter’s 2,000-year-old rock art. Her award-winning 2016 book interprets the paintings in light of contemporary indigenous traditions and Aztec mythology – and finds in the mural a story of creation and transformation. The confluence of the Pecos and the Rio Grande is the Chihuahuan Desert’s lowest, hottest point. The landscape bears the evidence. Across sun-blasted limestone, stunted plants seem to writhe and twist, waiting out the harsh sentence of soil and sky. From uplands on the Pecos, a trail lead into a side canyon, then to a shallow cave – and the utterly unexpected. Images blanket the 25-foot cave wall. Towering human figures with outstretched arms, renderings of deer and centipedes. Abstract or ambiguous forms – a stepped arch, an undulating mass – part-serpent, part-catfish. The paintings here at White Shaman Shelter, and at related sites across the Lower Pecos, have long fascinated visitors. But they’ve often been seen as disparate, random. If there were ideas here, scientists said, they could never be interpreted. In 2016, Dr. Carolyn Boyd published “The White Shaman Mural.” It’s upended that consensus. And it’s changed North American archeology. Boyd came to the Lower Pecos as an artist, a professional muralist. She traveled to White Shaman in 1989, to draw its images. She quickly saw a single composition. There was order even in the application of paints. In the scores of images, all the black had been applied first, followed by red, yellow and white. Clearly, its creators carefully planned the entire work. The images changed Boyd’s life – their study became her vocation. She pursued first an undergraduate degree and then a PhD in archeology. White Shaman is an example of Pecos River Style rock art. Across these canyonlands, beginning about 4,000 years ago, a hunter-gatherer society created hundreds of intricate murals. White Shaman was painted about 400 BC. In 1992, Boyd read Barbara Myerhoff’s “Peyote Hunt,” on Mexico’s contemporary Huichol people. It was a turning point. 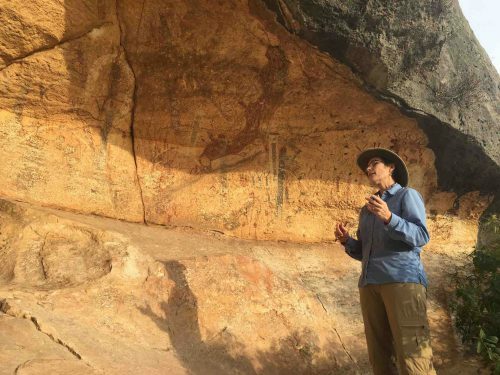 “And as I was reading that book, I thought, this is uncanny, but there are a lot of parallels between this ritual hunt and what I’m seeing in the rock art,” Boyd said. Each year, Huichol pilgrims travel to a sacred mountain to “hunt” peyote and to reenact the journey of their ancestors through the underworld – to the place where the sun is born and time begins. White Shaman is dominated by five anthropomorphic figures – with attributes similar to the Huichol pilgrims. Huichol shoot peyote with arrows – in the mural, cactus images are pierced with darts. But this was only one “layer of the onion,” Boyd said. The Huichol speak an Uto-Aztecan language – as did the ancient Nahua, or Aztec. With Nahua traditions, Boyd found stunning numerological connections. The mural contains an arch at one end – a mountain or pyramid. It’s lined with steps – six on each side, with an intricate figure emerging from a 13th step, at the summit. The Aztec believed in 13 levels to the heavens. The pyramid of Quetzalcoatl is built with six steps on each side. Boyd had found a creation narrative – perhaps the oldest recorded in North America. In 2017, Boyd received the Society of American Archeology’s scholarly book award. Debate and dissent will continue, as they must in science, but it signaled a paradigm shift. Rock art is not beyond interpretation. Creation stories – stories which locate us in the cosmos, amidst universal cycles – are among the oldest of human products. Lower Pecos peoples likely brought their stories with them from elsewhere. Having found a way to read that story, archeologists may find it in other times and places. 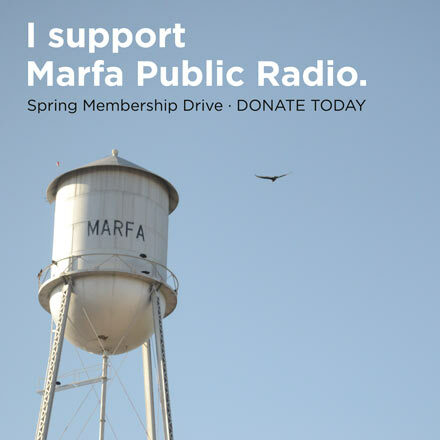 At the harsh edge of West Texas, a new understanding of the past is emerging.